Since I began commuting nine years ago, I’ve worked for three four different employers. All have been located within five miles of my residence at the time, and that short distance encouraged me to leave the Metro behind and either bike or walk to work. Now I exclusively bike or walk to my office, something that I know I’m extremely lucky to be able to do. Over the course of commuting to these jobs, I’ve seen how employers can influence and even encourage people to bike commute. The following are my experiences commuting to three different places and a description of the various bike commute setups used by each employer. These environments helped shape my opinions about employers’ roles in creating a conducive environment for bike commuting. Bike commuting isn’t only the ride from home to work. It’s also about what happens once you and your bike arrive at the office. Type of Rack: Prison bar-style rack that can take several bikes in theory, but unless you park on the ends, requires you to lift your bike up over the rack (a vile proposition for bikes with fenders) to then lock your front wheel and bike to it. Discussion: Minimally acceptable, this commute environment made me a mostly fair-weather commuter. I detested leaving my bike out in the elements on rainy days, and never looked forward to a ride home on a wet bike. I did so on rare occasions, but I wasn’t happy about it. A good bike lock and proper locking technique were mandatory. Even then, I still had moments of worry about my bike and I would often go out to check on it a couple times during the day. The lack of shower facilities was not a huge deal given my proximity to the office, but another inconvenience. I always felt slightly undignified having to change in a bathroom stall in the event that I did not wear my work clothes on my commute. Type of Rack: Prison bar-style rack that can take several bikes, but unless you park on the ends, requires you to lift your bike up over the rack to then lock your front wheel and bike to it (as previously mentioned, not good for any bike, but really does not work for bikes with fenders). Discussion: You never know what you got until it’s gone. Man, that Workout Club was nice. I should have spent more time appreciating it. It allowed me a place to change out of my cycling clothes if I needed, workout after work, and I didn’t even have to bring my own towel. The covered bike parking in a garage within eyesight of the staff who worked there gave me peace of mind. 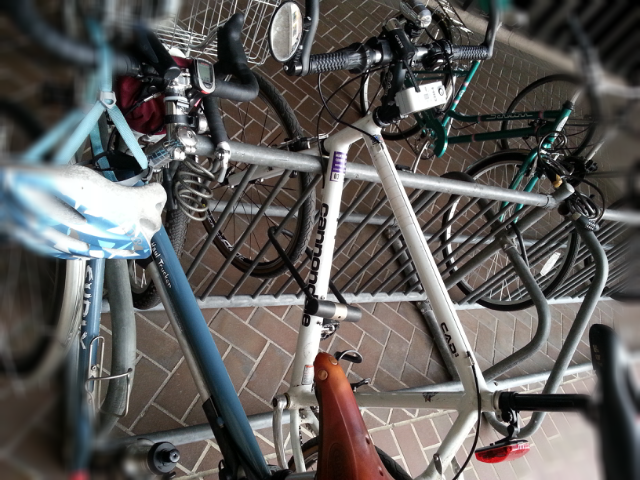 Yeah, the bike rack was rather crappy, but normally not enough cyclists parked there to make it an issue most days. 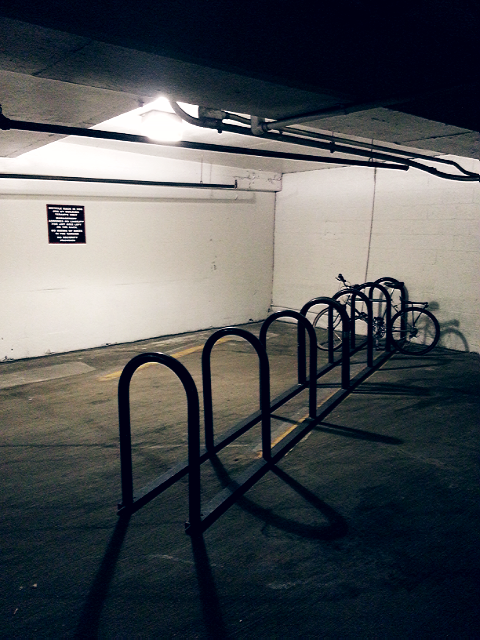 For a while, the building attempted to add an additional bike rack in an obscure corner of the garage, but 1. I did not feel safe using that space at night; and 2. The rack was lodged in a corner between two perpendicular rows of parking divided by a pillar. That visual might not be coming together for you, so I drew it for you. Use of the rack required a person to squeeze his or her body between the pillar and the front corner of the car while hefting their bike up to fit their bike into the rack. Ridiculous. I returned to that parking garage one day and checked on that rack. No one is using it. Office or Cubicle: Office! With a door! Park your bike in your office! Shower facilities: Showers and locker rooms in building (and happened to be located on the same floor where I worked). Other perks: $20 per month in bicycle benefits. The money could be used for repairs, bike rentals, lights, cables, helmets, tires, and to offset the cost of a bicycle. Discussion: This employer made me feel like I hit the bike commuter jackpot. The simple act of letting me keep my bike in the office encouraged me to commute. I did not have to leave my bike outside, uncovered, and unsecure. It spent the day hanging out with me. My office was small, but as I did not host meetings in it, the limited space was not an issue. Cycling was not treated as some weird fringe form of transport. It was viewed as simply another way of getting to and from work. Bike commuting was not common in my building by any means, but it was not something pushed to the side, either. Regularly seeing bikes can also plant the seed in someone’s mind about the possibility of bike commuting as opposed to Metro or driving. The $20 per month bicycle commute reimbursement added up to an annual benefit of $240. That money helped me pay for some work at the bike shop, a new helmet, and part of a new bike frame. It may not be much compared to what some receive for a Metro or parking subsidy (which I have my own feelings about), but it’s a solid step in the right direction. 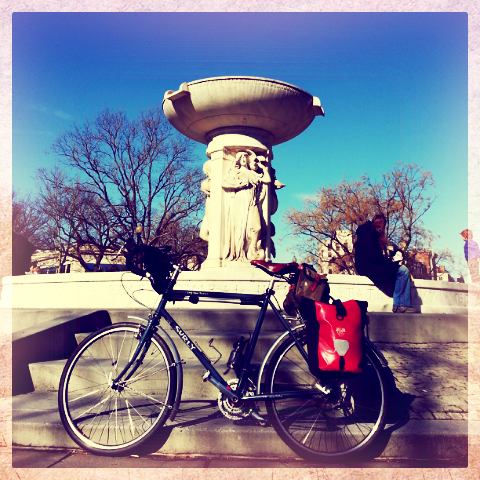 Through bike commuting to different places, I’ve learned a lot about how employers set the tone for bike commuters. Are we an afterthought, a sad little bike rack that holds hardly any bikes left out in the elements to rust away, or are we a welcome transportation method that employers actually put thought into and encourage? Yup. My agency has 52 U rack parking spots – in a covered garage – with a fitness center with a shower-only membership. And lockers. And lots of other good stuff. And we have lots and lots of cyclists! Good parking and a shower – makes a huge difference. That’s why my agency was certified as a BFB. 52 U-rack parking spots for bikes? I’m swooning! I am so glad to hear that you’ve been working your way up the bike commuter totum pole rather than the other way ’round. I feel so very blessed to have a locker room and shower at work. It makes all the difference. Since my commute is long (15 or 20 + miles each way depending on which route I take) winding up in need of some cleaning up is basically inevitable. The infrastructure in our area has improved dramatically in the ten years I’ve lived up here with further improvements in the pipeline. There’s still work to do, like convince the authorities that the Hudson River crossings should be open after 5:00pm in the winter (hard to get home without a bridge) but I, too, feel like I’ve hit the bike commuter jackpot. The main thing holding me back from commuting daily is driving my kids to school, but . . . wait for it . . . my daughter gets her license in a month, so soon I will be footloose and fancy-free. By the way, that Light & Motion headlamp I picked up on your recommendation is out of this world! Oh, I neglected to mention, I’m organizing a bike-to-school day in May to spread the bike commuting love to the next generation. I am a cube guy. No showers, but my commute is two miles to the train, then two miles from the train station to the office , so no big deal. It would be nice though! Nice to see you have such a bike friendly employer. My company is bike friendly, but my building is not. I mainly commute with my folding Bike Friday Tikit, so that I can take it right up to my floor and stash it under my desk. If I ride either of my two full-size bikes, I am supposed to park it in the underground dungeon, then take a freight elevator up to my floor. It’s rather tedious, to say the least. Ugh. Glad to hear the folding bike method has worked for you. An underground dungeon is no place for a bicycle! Yup. I’ve experienced varying degrees of bike commuter friendliness too. 1. Working in workshop. Left bike parked in corner, which was great. But being known to be transgendered I couldn’t use the showers because the men in another workgroup threatened to go on strike (and were threatened with the sack but I still wasn’t allowed to use their showers – I mean, really? I’m not that interested in dangly bits). I cycled 25km (15 miles) sporadically in winter because too hot rest of year. 2. Bike cage in garage but no racks so all bikes stacked against sides of cage. First in meant shifting all other bikes to get out. Two tiny shower cubicles that were shared by 50-100 men in the peak arrival time. Talk about getting to know your colleagues. No one cared about me being transgendered. I cycled 35km (20 miles) each way every day. 3. No bike parking and no showers. Impossible to commute in summer where temperatures reach 30+’C (86+’F) by 8am. Hide bike in conference room but have to find other hiding spots during meetings. I cycle 13km (8 miles) sporadically over winter. Thanks for sharing your experiences. 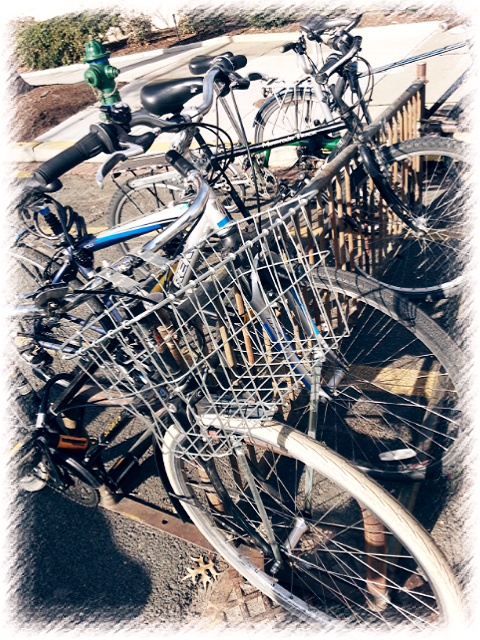 What a bike parking nightmare at job #2. Also, no showers OR parking at #3? That is awful! What a nice comparison. But all of the descriptions seem to be in the past tense. How about now? Are you still at Job 3? Hey, Bill! No, no longer at Job 3. I’ve moved onto Job 4, and back to a cubicle lifestyle! Great piece! I’m lucky to have a (cheap) gym, good inside bike parking, and several of the attorneys, partners included, also bike to work. I love it when other people in the office ride, too. It really helps with the bike-friendly environment. My Brompton folding bike makes my 12 mile each way commute possible because it gives me the option of a one way commute. I can take the commuter train into work and wear business clothes and then change into riding clothes for the trip home. The bike folds up to the size of a suitcase and, with its cloth cover “disappears” as a bicycle. This allows me to bring into my “no bikes allowed” office. That’s cool. 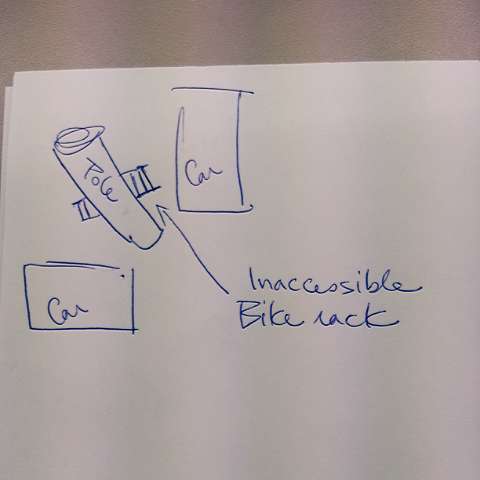 I have a Bike Friday Tikit that I’ve been thinking about setting up for commuting so I could leave it in my cube. It does not fold as small as a Brompton, but it would easily fit in my now-reduced space in Job 4. Yeah, the bike lights now are AWESOME, hold a charge well, and are light when compared to some of the older pre-LED lights. Thanks for such a good article, and illustrations. My workplace is finally, reluctantly offering to consider bike racks but not showers not really a bike-friendly atmosphere. I plan to use your article to articulate the differences. Thanks for the encouragement. Wow, I hope they at least make some decent racks available. Good luck working with them to make your work bike-friendly! 16 miles each way (or longer on nice evenings with a little extra time). I’m fortunate that I get a say in setting office policy so of course, bikes are welcome on the office! I’ve learned to make do with a baby-wipe bath when I arrive at the office, a closed door affords me the needed privacy. But I think you’re spot on about employers setting the tone. At my distance, a shower facility or some privacy are essential. I don’t see how I could do it without one or the other. Now I gotta go see about implementing that bike commuter expense account!! You have a great commute, mileage-wise. Yeah, the office with a door is a GREAT benefit. I don’t have that in my current position and really miss it when I’m in need of the presto change-o routine.